Discussion in 'iPad General Discussions' started by ritchdude, Apr 26, 2010. Does anybody know of a full sized stylus that will work with the ipad. the ones for the iphone are just to small for me. Ten One Designs makes a full size stylus that works with the iPad called the Pogo Sketch. I just ordered mine, so I can't really give you a review on it. 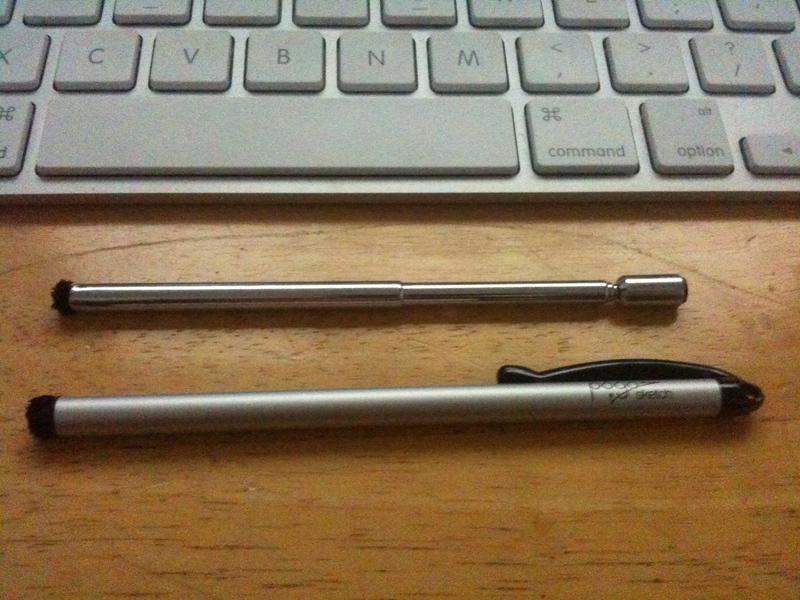 They also make the smaller stylus for the iPad which will also work with the iPad. I will follow up with a review once I get mine if anyone is interested. I will have to follow this thread since I am curious about a stylus myself. I have also ordered 2 pogo sketches... & I am hoping they work. I use a simple stick that I lay across the canvas to the right edge and that I hold with my left hand. On the iPad it could be a simple thin notebook. But you'd have to be careful to raise your grip on the stylus too. I have a pogo sketch,it is only about 4" long,I am looking for a stylus the same size as a regular pen. Cross makes a very nice one,but it will not work with the iPad. I've been using a Pogo Sketch for over a week now with my iPad. It's nice and does work as it states and also as I have seen in YouTube videos. The only thing I wished they had included with the stylus was a cap to protect the drawing tip. It is a soft material (same anti static material used to house IC's and Transistors when shipped). I was so excited waiting for mine, that I couldn't wait any longer and made my own to test with. I used an old telescopic radio antenna and inserted in the open end some of that material (anti static) and it work quite well, but not as well as the actual Pogo Sketch. I've done some line art as well as caricatures on the iPad since then using Sketchbook Pro. Some of you will want that glove you heard about, it will certainly reduce the accidental taps and scrapes your palm will make. Other than that, its an excellent drawing surface on the iPad and will induce a sort of glide effect to your drawings, as compared to paper that has the feel of drag and to some is easier for blending. But with the right practice the iPad makes a great drawing surface and blending just comes easier each time. If you haven't used many electronic/computer aided drawing programs, its a steep learning curve other than your natural ability to compose, but the controls and tools in the software can be daunting at times to discover and learn to incorporate into your technique. Now to just find an appropriate cap to protect the tip when not using it. It does have a clip to use for a pocket or small bag, but the tip is still exposed and gathers lint and dust like you wouldn't believe. I liked mine enough to order a few new replacements or spares. Please let us know if you find a dagi stylus to order & how well it works. I have looked for one... the only ones I can find are on EBay & it seems you have to order 3 at time from overseas. Thanks for the tips with the pogo sketch, I will look for a substitute cap in my art supplies when my pogos eventually arrive.